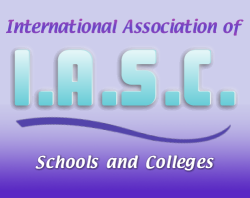 The International Association of Schools and Colleges (I.A.S.C.) accredits only programs meeting rigorous academic criteria, including a commitment to nourish individual student strengths. Since government sponsored accreditation, especially in the United States, has perennially resulted in poor academic performance measured with respect to international standards, in 2000, the I.A.S.C. Governing Board rejected recognition by the U.S. Department of Education. To accept U.S. DOE recognition would have required that I.A.S.C. accredited schools pre-prepare all courses irrespective of the students to be served. The I.A.S.C. Governing Board unanimously agreed that following that path would seriously compromise I.A.S.C. accredited schools' ability to deliver courses sensitive to individual student need. The I.A.S.C. is the world's only international Student-First (SF) accrediting body. The I.A.S.C. obtains its accrediting authority from a cadre of independent Advisory Board members who serve without pay or financial benefit, and who represent the very highest student-first educational standards. I.A.S.C. accreditation is available to all institutions that offer student-first programs. Student-First (SF) programs are defined as programs which build courses around an individual student based on his or her learning style, aptitudes, subject skill levels, and interests. The I.A.S.C. serves to certify that an institution is promoting a Student-First educational model. Student-First schools rely on input from students, parents/guardians, and credentialed teachers using such accepted tools as Holland Testing (oral and written), and student interviews to design curricula that will encourage students to lead with their strengths. Student-First schools replace the traditional static curriculum/syllabus course orientation with a dynamic, wide-ranging, flexible design model, a model sensitive to the point-in-time needs of each student. I.A.S.C. Student-First accredited programs offered by universities, colleges, secondary schools, and private tutors work on the principle that only trained instructors possessing knowledge of each student's aptitudes, skill levels and subject concentration interests working with students directly can determine program delivery methods successfully. Currently, most universities, colleges, secondary schools and private tutors implement a syllabus/textbook-first program structure that determines method prior to understanding individual student requirements. This, without exception, leads to a partial or full failure on the part of a program to maximize a student's learning experience. The teacher and student in an I.A.S.C. accredited program have the ability to adjust program methods on a point-in-time basis, thus accommodating changes in student variables as the process of maturation unfolds. Be certain to take a look at the complete index of valuable educational articles in our free online library.